Note : The module is dependent on Bootstrap 3. So the module is suited only for Prestashop Themes (including Prestashop’s default theme) built on Bootstrap 3. 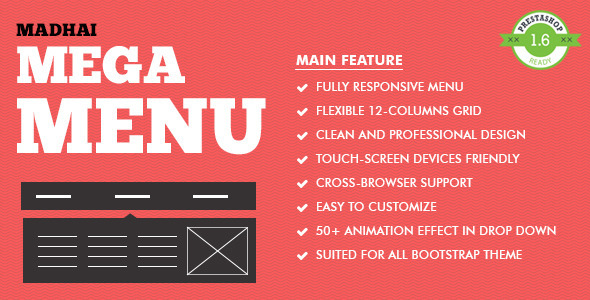 Madhai which means “beautiful” in tamil language is a responsive mega menu module built for Prestashop. The back office for managing the megamenu is very easy to use and allows the back office user to build a complex and yet simple megamenu. We have been shipping this megamenu with our themes and now we are making it available for other users as well. Built on Bootstrap – Default Prestashop theme uses Bootstrap. This entry was posted in Uncategorized and tagged bootstrap, bootstrap-megamenu, database, dropdown, feeds, forms, media, megamenu, menu, php, prestashop, scripts, sliders, yamm by Acty. Bookmark the permalink.